Britain and New Zealand have agreed to set up regular trade policy talks to help push for greater global trade liberalisation and reform as Britain leaves the European Union, trade minister Liam Fox says. Britain, which voted to leave the European bloc in June, is keen to court countries outside the EU on trade, but cannot formally agree to any deals until it has left the bloc, a process which will take at least two years from when it starts divorce talks. 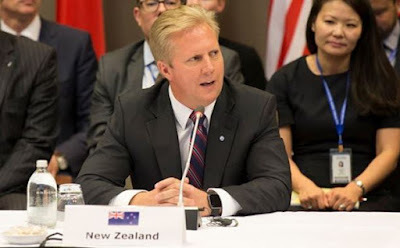 “In leaving the EU, we have the opportunity to drive even greater openness and put Britain at the forefront of global trade,” Fox said in a statement after meeting New Zealand’s minister of trade, Todd McClay. Prime Minister Theresa May, appointed leader shortly after the June referendum, has said she will trigger the formal divorce procedure — Article 50 of the EU’s Lisbon Treaty — by the end of March next year. New Zealand, Australia, Canada and other members of the Commonwealth, whose members are mostly former British colonies, have been targeted by British officials as potential areas of growth. McClay said New Zealand was keen to agree a trade deal. “The UK is a major trading partner for New Zealand, and we have signalled our interest in a free trade agreement with them when they are in a position to negotiate one independently of the European Union,” he said. Brexit has provided multiple opportunities for the United Kingdom to expand trade and immigration policies to the Commonwealth. Previously, we have seen Australia and the UK discussing post-Brexit trade negotiations, with visa liberalisation and free movement also being discussed as part of the talks. We hope that as with previous conversations between Julie Bishop (Australia) and Boris Johnson (UK), the issue of free movement will also be discussed between Todd McClay (New Zealand) and Liam Fox (UK) as the United Kingdom considers post-Brexit trade options, and in addition, post-Brexit visa reform for Australia, New Zealand and Canada.